The Wolf tells the tale of Roper, son of Kynortas, the Black Lord. When Kynortas is felled during a failed battle against the Sutherners, control of the legions and the Black Kingdom is instantly bequest to Roper, forcing him to make the most difficult decision on the battlefield. On his return to the Black Kingdom, he has to face the music. An inexperienced ruler facing opposition from everywhere possible, including the Captain of the Sacred Guard, Uvoren, Roper has to use all of his strength and cunning to fortify his position as the Black Lord. Quickly developing political skills, Roper learns where he needs to make allies and where he needs to ultimately befriend people, that even the Black Lord himself shouldn’t be associated with, putting not just his position, but his life in danger. During this journey, Roper twists and turns to try and carry favour with the people of the Black Kingdom, getting help along the way from a few trusted allies. The only real way to gain the complete support of his subjects is to take revenge on the Sutherners for what they did to the forces of the Black Kingdom, and what they did to his father. Roper has the ultimate test ahead of him. The Wolf is set in medieval times, with armies of pike men, cavalry and berserkers, where the sword is typically the weapon of choice. If you don’t know much about this era, you needn’t worry. Leo does a wonderful job of setting scenes. His descriptions of buildings, rooms and atmosphere are fantastic and it is very easy to put yourself in the scene, right there with the characters. The battle scenes would be right at home in the film Braveheart and are wonderfully detailed. I’m not a particularly fast reader (3-4 weeks for a book), but I could not put this book down, finishing it in barely a week. I couldn’t wait to see how Roper would overcome his next challenge or see who else would choose to go up against him. There is so much more that I could have included in the synopsis that I have written, but I really didn’t want to spoil the events of the book, and there are many of them. 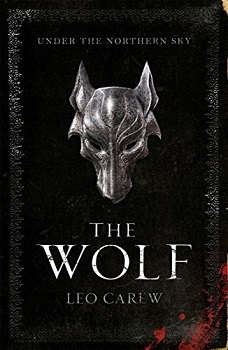 With a fast pace and wonderfully descriptive writing, The Wolf is well worth a read, even if the medieval time isn’t your normal area of interest. This book is so easy to read and you will get a lot of enjoyment out of it. If I had one criticism of the book, I would say that some of the chapters could be shorter – I’m a fan of the sort of length that Dan Brown uses, making it easy to put the book down when you realise that you’ve been reading it for too long – but I have to say, with this book, even when you do realise that you’ve been reading it too long, you still won’t want to put it down! I am now eagerly looking forward to the second book in the series, The Spider, which is released April 2019. I’m picky with this sort of genre but it sounds good! I actually do not mind the longer chapters. I have not read this book, I tried and didn’t like it. I am not into medieval battles. I thought it would be about werewolves. I don’t think it’s a book for everyone. Great review. I am not sure this is something that I would read but I enjoyed your review. I fear I am far too lazy for all that world building – but glad yo liked it. It is nice that this book captured your attention. Thank you. It is super intriguing. I love to read this kind of books a lot. Wonderful, I hope you enjoy it too. Great review, this one looks and sounds absolutely fantastic. I am really glad you fully enjoy this book. Thank you so much for sharing your awesome post. It’s out next year. Perhaps read the first just before the next comes out.